When Ellie and her friends go camping, they have no idea they're leaving their old lives behind forever. Despite a less-than-tragic food shortage and a secret crush or two, everything goes as planned. But a week later, they return home to find their houses empty and their pets starving. Something has gone wrong - horribly wrong. Before long, they realize the country has been invaded, and the entire town has been captured - including their families and all their friends. Ellie and the other survivors face an impossible decision: They can flee for the mountains or surrender. Or they can fight. Tomorrow, When the War Begun is set in Australia. A group of teens set out camping, bush bashing as it's called. Told from Ellie's point of view, writing a journal to recant the story of how live became to be after the invasion. After their week long camp, they return to a ghost town. No parents, no children playing. Houses and shops are abandoned. The only movement seems to be a few rare curtains fluttering and foreign troops patrolling the streets on foot and in tanks and trucks. Realising something is terribly wrong, the teens head back to Ellie's house to find all but one of her beloved dogs have died, food is spoilt and rotting, but no one seems to have left in a hurry. What happened? As they carefully make their way around to each of their homes, the group of teens fear the worse. Where have they taken everyone? They had left during the week of the local country show, a prime opportunity to take the town swiftly and without causalities. With their parents, families and friends being held at the showgrounds, invading foreign troops hot on their heels, how will the teens survive? Retreating to their camp, they devise a plan, this is our country and we'll be damned if we let them take it from us. LOVED IT! 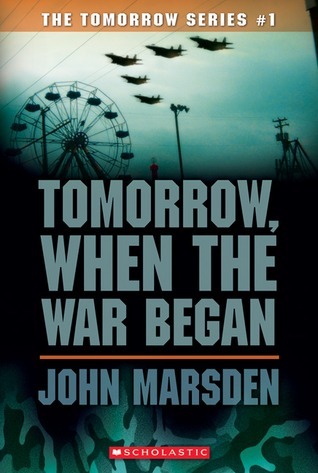 I was hesitant to read Tomorrow, When the War Began due to the movie, but so thankful I convinced myself to take a chance. It was brilliant and the film didn't do the book justice at all. I love reading Australian novels, the language and phrasing make you feel as though you are right there with the characters. A tad frightening to even contemplate an invasion in our own backyard. It was brilliantly scary!